Regardless of how you feel about Valentine’s Day, you can’t deny the fun treats that come along with it. Personally, I am more of a Galentine’s Day kind of lady. There’s something really refreshing about defying the typical Valentine’s Day expectations, because if I’m being honest, the sparkly diamond necklaces and oversized teddy bears just aren’t my thing. (That’s another rant for another day, though!) And as a crafty foodie, the holiday mainly doubles as another chance to make themed treats, like this cinnamon heart lollipop DIY. This one was created for eHow, and you can be sure I geeked out over making shaped lollipops. Plus, silicone molds are just too fun. The cool (hot?) part is that this treat calls for cinnamon Jolly Ranchers, so you don’t have to deal with a sticky mess of corn syrup and sugar in your favorite saucepan. This is an awesome idea if you need a quick and cheap Valentine’s Day project for classmates, friends, or co-workers. And yes, I totally use edible gold stars to make an emoji-inspired heart lollipop. You’re welcome. 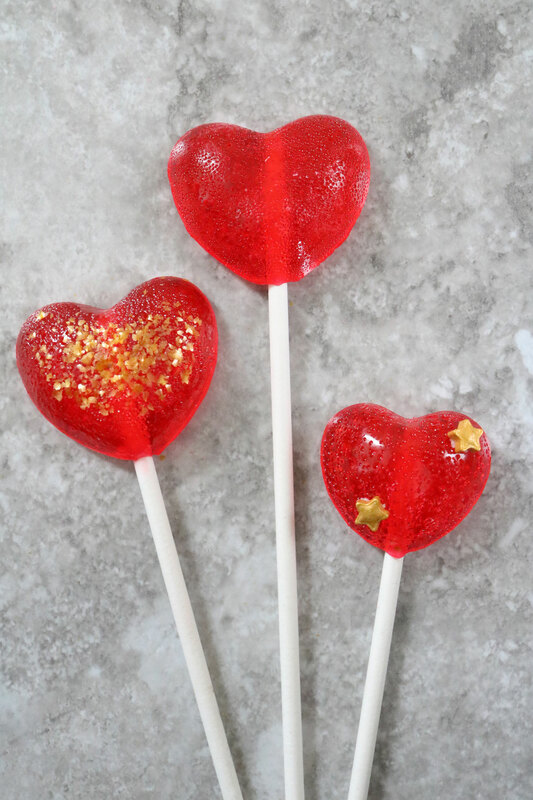 To make your own batch of cinnamon heart lollipops, visit my tutorial at eHow.